For almost three years Lumen Learning has been helping faculty, departments, and entire degree programs adopt OER in place of expensive commercial textbooks. In addition to saving students enormous amounts of money we’ve helped improve the effectiveness of courses we’ve supported, as we’re demonstrating in publications in peer-reviewed journals co-authored both with faculty from our partner schools and other researchers. We’re making great friendships along the way. It’s been absolutely amazing. Last year we received one of seven grants from a Bill and Melinda Gates Foundation competition to create next generation personalized courseware. We’ve spent the last year working with something like 80 faculty from a dozen colleges across the country co-designing and co-creating three new sets of “courseware” – cohesive, coherent collections of tools and OER (including some great new simulations, whose creation was led by Clark Aldrich, and newly CC licensed video from the BBC) that can completely replace traditional textbooks and other commercial digital products. There is no active role for the learner in this “personalized” experience. These systems reduce all the richness and complexity of deciding what a learner should be doing to – sometimes literally – a “Next” button. As these systems painstakingly work to learn how each student learns, the individual students lose out on the opportunity to learn this for themselves. 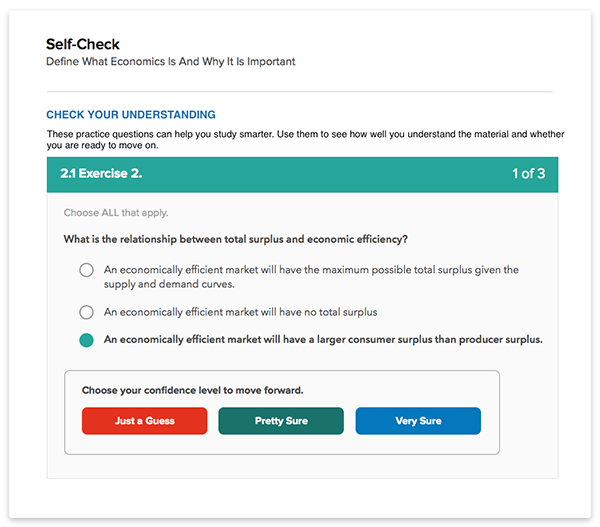 Continued use of a system like this seems likely creates dependency in learners, as they stop stretching their metacognitive muscles and defer all decisions about what, when, and how long to study to The Machine. This might be good for creating vendor lock-in, but it must be terrible for facilitating lifelong learning. We felt like there had to be a better way. For the last year we’ve been working closely with faculty and students to develop an approach that – if you’ll pardon the play on words – puts the person back in personalization. Or, more correctly, people. Our approach still involves building up a model of what the student knows, but rather than presenting that model to a system to make decisions on the learner’s behalf, we present a view of the model directly to students and ask them to reflect on where they are and make decisions for themselves using that information. As part of our assessment strategy, which includes a good mix of human graded and machine-graded assessments, students are asked to rate their level of confidence in each of their answers on machine-graded formative and summative assessments. This confidence information is aggregated and provided to the learner as an explicit, externalized view of their own model of their learning. The system’s model is updated with a combination of confidence level, right / wrong, and time-to-answer information. Allowing students to compare the system model of where they are to their own internal model of where they are creates a powerful opportunity for reflection and introspection. We believe very strongly in this “machine provides recommendations, people make decisions” paradigm. Chances are you do, too. Have you ever used the “I’m Feeling Lucky” button on the Google homepage? If you haven’t, here’s how it works. You type in your search query, push the I’m Feeling Lucky button, and – instead of showing you any search results – Google sends you directly to the page it thinks best fulfills your search. Super efficient, right? It cuts down on all the extra time of digging through search results, it compensates for your lack of digital literacy and skill at web searching, etc. I mean, this is Google’s search algorithm we’re talking about, created by an army of PhDs. Of course you’ll trust it to know what you’re looking for better than you trust yourself to find it. Except you don’t. Very few people do – fewer than 1% of Google searches use the button. And that’s terrific. We want people developing the range of digital literacies needed to search the web critically and intelligently. We suspect – and will be validating this soon – that the decisions learners make early on based on their inspection of these model data will be “suboptimal.” However, with the right support and coaching they will get better and better at monitoring and directing their own learning, and the person to whom it matters most can effectively personalize things for themselves. Speaking of support and coaching, we also provide a view of the student model to faculty and provide them with custom tools (and even a range of editable message templates written from varying personalities) for reaching out to students in order to engage them in good old-fashioned conversations about why they’re struggling with the course. We’ve taken this approach specifically because we believe that the future of education should have much more instructor – student interaction than the typical education experience today does, not far less. Students and faculty should be engaged in more relationships of care, encouragement, and inspiration in the future, and not relegated to taking direction from a passionless algorithm. This stuff is so fun. There’s nothing quite like working with and learning from dozens of smart people with a wide variety of on the ground, in the trenches experience on the teaching and learning side, and being able to bring the results of educational research and the capabilities of technology into that partnership. You never end up making exactly what you planned, but you always end up making something better. Lumen Learning provides high quality open courseware and support for educational institutions to help them eliminate textbook costs, broaden access to educational materials and improve student success through the effective use of open-educational resources (OER). © 2014 Lumen Learning, LLC. Lumen Learning, Candela and the Lumen logo are trademarks of Lumen Learning, LLC. Unless otherwise noted, content on this site is licensed under the Creative Commons Attribution 4.0 License. Attributions.